Christopher Carosa, CTFA, chief contributing editor of FiduciaryNews.com, has written more than 300 articles on fiduciary and investing topics. A popular and entertaining speaker at industry conferences from coast to coast, Carosa has been interviewed and quoted in The New York Times, Barron’s, CNN and Fox Business News, among other media outlets. 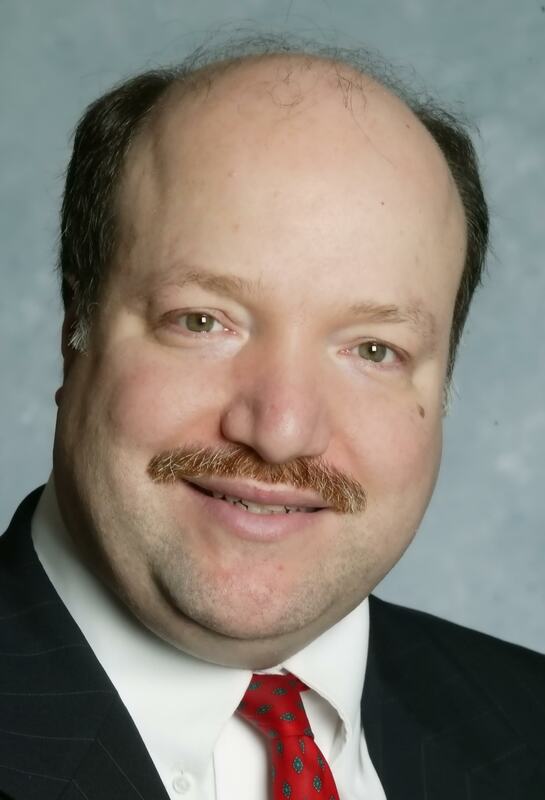 He has been a successful trust officer and portfolio manager, including establishing his own proprietary mutual fund. He always enjoys sharing the knowledge and experience garnered over his three decades in the financial industry with others facing the same compliance issues as he does. 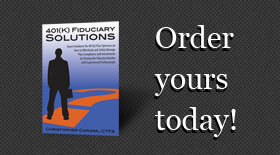 In 401(k) Fiduciary Solutions, Carosa covers all 401k compliance issues in a single reference source and introduces, to many for the first time, how recent research in behavioral economics can help guide plan sponsors to building better 401(k) plans. After earning a degree in physics and astronomy from Yale University in 1982, Carosa joined the financial management firm Manning & Napier Advisers, Inc. Beginning his career as a lowly “Computer Coordinator” (just a fancy name for a glorified data entry clerk), he went on to become Data Processing Manager, MIS Director and Managing Director of Operations, where he helped developed the firm’s proprietary mutual funds and authored a portion of an SEC no-action letter dealing with securities trading and settlement in the post-DTC era. The firm ultimately gave him the opportunity to create a revenue generating division called Custody First, which provided custodian services for firm clients and that led to his development of and direct involvement in the firm’s creation of Exeter Trust Company, where he served as Executive Vice President and Senior Trust Officer as well as being a member of the Trust and Investment Committee. During this time, Carosa went on to earn an MBA from the Simon School at the University of Rochester and the CTFA (Certified Trust and Financial Adviser) professional designation from the Institute of Certified Bankers. He simultaneously began his writing career when he founded the Mendon-Honeoye Falls-Lima Sentinel, a weekly community newspaper, where he provided a regular column called The Carosa Commentary. (An archive of those columns can be found on his personal web-site here.) 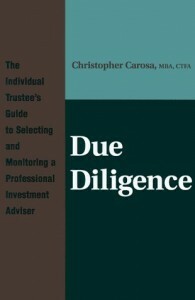 Carosa wrote his first book, Due Diligence: The Individual Trustee’s Guide to Selecting and Monitoring a Professional Investment Adviser, in 1999. He also contributed a chapter to the book Planning for the Affluent (Aspen Publishers, 2003). Today, Carosa is president of Carosa Stanton Asset Management, LLC, a boutique SEC-Registered Investment Adviser and President, Portfolio Manager and Chairman of the Board of the Bullfinch Fund Inc., a family of no-load mutual funds. Both firms are headquartered in Mendon, New York. Carosa doesn’t limit his writing to financial topics. (In fact, his writing career actually began in first grade and you can read that story here.) In 2008 he wrote a stage play – The Macaroni Kid. This romantic comedy featured a number of songs with original lyrics and was performed before sell-out crowds. In 2009, as part of an officially sanctioned United Nations Project he designed for the International Year of Astronomy, Carosa began writing The Astronomy Top 100, which highlights, in a style those without a scientific background might enjoy, the top 100 images and imaginations in the history of astronomy and space exploration as voted on by astronomy professionals and enthusiasts from across the globe. In 2010, he helped his daughters launch MightyMovieMoments.com, which offers both his and his teenage daughter’s reviews of classic movies. In 2011, he began chronicling the Lifetime Dream Process, a time-management and goal-setting methodology he first used when he was a sophomore in college and has since adapted to benefit his investment advisery clients. Finally, in 2012, he began writing a book near and dear to his heart: The 50 Hidden Gems of Greater Western New York. #401k Summit Happens in Vegas, Doesn’t Stay in Vegas | National Association of Plan Advisors… https://t.co/Xja8geAVCn about 5 hours ago from Hootsuite Inc.
DOL’s Target for Missing #401k Participants Is 'Zero' - 401K Specialist https://t.co/tuVbbHIzUk #fiduciary #IRA #retirement about 7 hours ago from Hootsuite Inc.
Fred Knows #401k #Fiduciary - 401K Specialist https://t.co/qnkz7KiQNL #IRA #retirement about 8 hours ago from Hootsuite Inc.
HSAs can help millennials save for #retirement | Employee Benefit News https://t.co/ErhLTT3Nmr #fiduciary #401k #IRA #retirement about 9 hours ago from Hootsuite Inc.
Coleman: Leverage the Changing FACE of Business | National Association of Plan Advisors https://t.co/e1cvkIp8R4… https://t.co/P6VE6x1Ely about 10 hours ago from Hootsuite Inc. Copyright © 2019 · Pandamensional Solutions, Inc.